Bandhan, the microfinance institution gearing up to become a bank shortly, had on July 2 invited applications from people with three to 15 years of experience in the banking and human resource fields. It had received close to 27,000 applications until Monday for the 15 posts on offer. What is more surprising is that 15-20 per cent of the applicants are from the reputed Indian Institutes of Technology and Indian Institutes of Management. And, half the applicants are from outside West Bengal; they are willing to shift their base from cities like Delhi and Mumbai to work in Kolkata. A large number of these applicants are already employed in top positions at public- and private-sector banks, say sources at Bandhan. 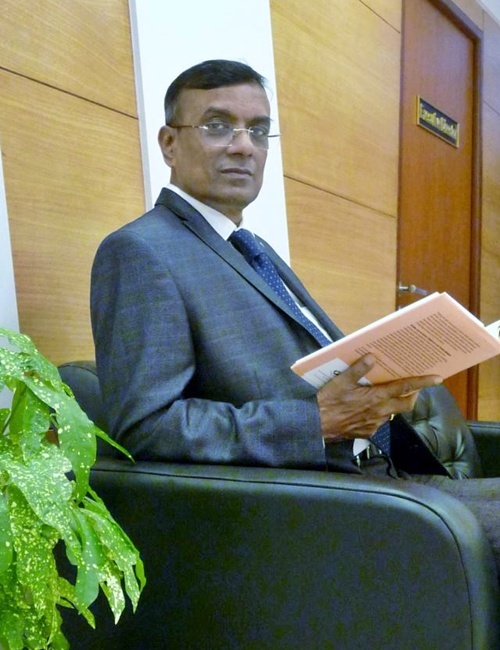 Image: Chandra Shekhar Ghosh, Founder, Bandhan Financial Services. Bandhan founder & Chief Executive Chandra Sekhar Ghosh says several top-notch executives from the corporate world have -- either informally or formally -- expressed interest in joining the bank. Ghosh, though, is not taken by the frenzy. In 2000, when Bandhan was a struggling microfinancier, there were few takers for its jobs; even advertisements to recruit at the village level interested few. “We expected this kind of response to our advertisement. “One of the criteria for these jobs will be candidates’ willingness to align with the Bandhan philosophy: Working with the poor. “We need people from different strata. So, while highly qualified professionals are needed, so are plain graduates,” Ghosh explains. Image: In 2000, when Bandhan was a struggling microfinancier, there were few takers for its jobs. 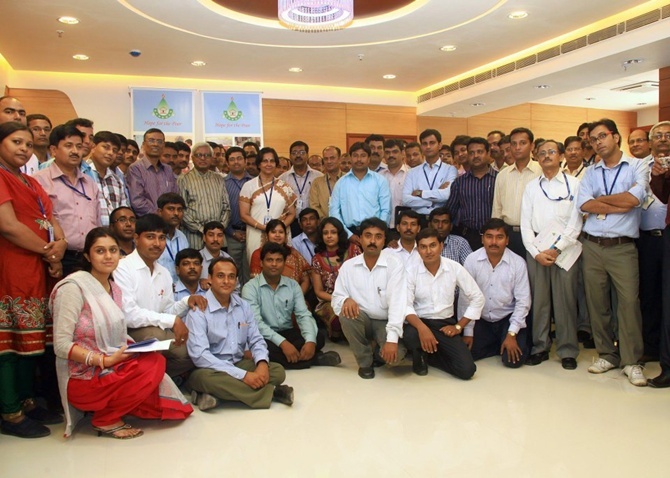 State Bank of India had last year received nearly 1.7 million applications for 1,500 probationary-officer jobs. This implied 1,133 candidates were vying for each post at the bank. By comparison, 27,000 applications for 15 Bandhan posts mean 1,800 people competing for each position. Nearly 70 per cent of Bandhan’s operations will be concentrated in rural areas, while the rest will focus on the large middle-class retail clientele. 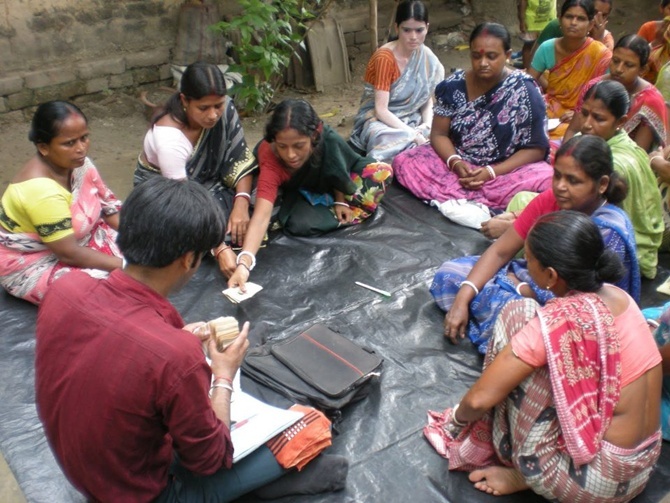 A majority of Bandhan’s staff, mostly those educated up to high school and graduates, are already placed in rural areas. At present, there are about 13,000 people on Bandhan’s payroll in rural areas; they are likely to be absorbed as regular employees of the proposed bank. 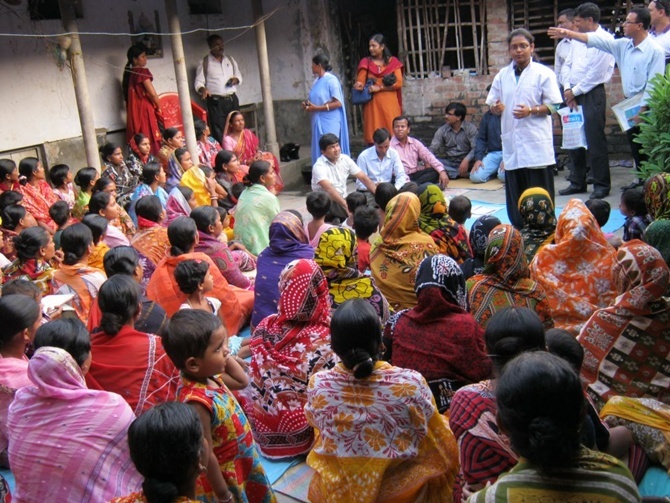 Image: Bandhan employees talk to the rural people. Almost simultaneously, Bandhan will open 600 bank branches across 22 states and is expecting to open at least 10 million accounts in one go. The bank is expected to start operating by the next financial year. Growth opportunities and work experience in a new set-up are some of the key reasons most applicants have cited for applying for Bandhan jobs during the interviews conducted so far, say Bandhan officials. Randstad, the world's second-largest staffing organisation for human resource consultancy services, is not surprised. “The issuance of new banking licences is expected to contribute to job creation in the near future. “We believe the cumulative effect of these trends will create around 500,000 direct and indirect jobs in the banking sector in years to come,” says Randstad India CEO Moorthy K Uppaluri. Image: The sprawling office of Bandhan at Rajarhat. Incidentally, it was about 64 years ago that Kolkata last saw a new bank being set up in the city. United Bank of India, Kolkata’s youngest bank, was set up in 1950 and nationalised in 1969. A new bank in the city is always expected to draw a huge response; many people who left home for jobs in Mumbai or Delhi would like to return to the city, says Bhaskar Sen, former chairman and managing director of United Bank. “Since Bandhan is going to be a first-generation bank, there are many people wanting to work in its setting up. To prepare a road map for its banking foray, the microfinancier had appointed Deloitte, which was also its consultant for preparing its application for a banking licence. Bandhan has about 2,116 branches in 22 states and a loan outstanding of nearly Rs 6,200 crore (Rs 62 billion). On an average, the microfinance institution disburses Rs 1,000 crore (Rs 10 billion) a month and its monthly collections are nearly Rs 700 crore (Rs 7 billion). At present, it has a share of nearly 25 per cent in the microfinance market. Bandhan’s investors include International Finance Corp, the World Bank’s private investment arm, Sidbi, Financial Inclusion Trust and Northeast Financial Inclusion Trust. Ghosh owns a 1.8 per cent stake in Bandhan, which will have to go for listing within three years of being converted into a bank. Image: Bandhan won many accolades. Image: Bandhan's dream is to help the poor live a better life. What helped Bandhan get the banking licence? Want to earn above Rs 1 crore a year?